I've fallen in love with under-cabinet lighting. For one thing, it splashes ample light across your countertops and can be a dramatic mood setter. Newer models of slim, fluorescent lights are warmer than you'd expect. They can remove those gloomy shadows cast by your cabinets, too. They hide below sight, install in an hour or less, and low wattage models are great for saving energy. I've done a quick roundup of three models I've seen while trolling the Web, and it should give you an idea of relative costs. I don't favor any item or manufacturer, by the way. These are just to stimulate your thinking and planning. 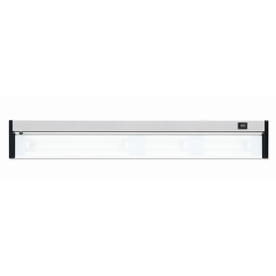 Lamps Plus offers this 7-inch-wide Xenon Starter Kit/Under Cabinet Light. There's a direct-wire installation of this single light and it installs in a snap. $89.99. Pegasus Associates Lighting sells Ultra-slim, Xenon Low Voltage Ultra-Slim Lights that power up on 12 volts. You can buy them in three finishes. Starts at $19.90. Lowes is selling this 4-Light Specialty Finishes Undercabinet/Rope Light. The sets can be linked together, drawing up to 600 watts. They can be wired directly or plugged into a socket. $39.98. One of the best things about this kind of lighting is that it installs easily as part of an overall kitchen remodeling project, or can be wired in as an after-thought. The fixtures themselves are designed to fit under the standard-sized depth of most cabinets and fit between the bottom of the cabinets and most appliances or other items you place on your countertops. And most can be returned in their packaging if you get them home and find that they stick out or cramp your style. But, of course, you're measuring first before ordering, aren't you? I've already blogged about the ability of under-cabinet lights to help with kitchen chores and refine your decor. You may even want to coordinate under-cabinet lighting ideas with general track lighting as a way of pulling the entire kitchen together. I like the idea of using them in-concert, saving energy from ambient lighting when you're out of the kitchen and just want low-wattage illumination on your countertops. That way, no one is stumbling around during late hours! This entry was posted on Friday, February 19th, 2010 at 02:02 pm and is filed under Electrical , Remodeling , Kitchens , General Remodeling . You can follow any responses to this entry through the RSS 2.0 feed.